Homerunning coaching Perpetual Forward Motion – who’s whispering the loudest? Who can whisper the loudest? Yes, the debate between cushioned trainers and minimal has been done to death over the past 12 to 24 months. Yes, ‘barefoot’ versus ‘traditional’ has been sided-over during the same period, discussed heatedly, with each party tending to stand their ground (no pun intended), remaining rooted to his/her original philosophy … at least the subject has never been without passion attached! But in the maze of the ‘hot news’ debates, the real issue somehow became lost. It should never have been about whether or not trainers are any good. It shouldn’t have become personal, in a battle about Nike/Adidas/Reebok versus Vibram Fivefingers/home-made huaraches. Real discussions, which would have been of value to runners, became side-lined in the ‘this expert says x’ and ‘this expert contradicts and says y’ word war. What about the useful information regarding how to go about running in a way that utilises the body so well, so efficiently, that you harness every muscle contraction possible to assist forward momentum? Looking at that from the other end, where were the conversations about avoiding all muscle contractions that interfere with forward momentum? It really is time for runners to enjoy their sport, and have access to all the tools to enable them to use their bodies to their best advantage. The footwear choices can be part of the story, but they aren’t the story. So – let’s start a new story. Isn’t efficiency really all about who can whisper the loudest? Relax, and just notice where you’re making ground contact – where the pressure points are, and how relaxed your toes are. Next, squeeze your buttocks together hard. Feel what happens. Relax again, and notice the result. Squeeze your buttocks again, just to be sure of the reaction. Can you feel that when you’re more active and the buttocks are engaged, your bodyweight is pulled back away from the toes, and you feel strongly grounded along the outside of the foot and the heel? Did you also notice the way the whole leg rotated in the hip socket and your knees were pointing straight ahead? Stand with a slight forward lean. What are your toes doing? Squeeze your buttocks together again. What are your toes doing? Can you feel that when your bodyweight is forward, your toes tend to grip or claw? Do it again, and this time when you feel the clawing of your toes, check what your buttocks are up to? Anything? Nothing! Squeeze your buttocks together, and don’t your toes relax? Can’t you ‘play piano’ with them? Can you feel your body alignment being pulled back? For some, it almost feels like they’re leaning back, when in fact, the buttock activity is simply resetting vertical. Fascinating, isn’t it? You’re pulling the strings and your body is already dancing. You have complete control – you just hadn’t thought of it before. Perform a ‘calf raise’ and stand on tippy-toes. Now relax your calves and your feet – completely. What happens? Contract your calves with a calf raise and stand on tippy-toes again. Relax your calves and your feet. Did your heels descend to the ground when you allowed your calves and your feet to relax? Can you feel the control you have over the muscle activity from the knee down? If there is tension there, the heel will be higher than the ball of the foot, and if the calves and feet are relaxed, the foot will contour the ground you’re standing on? Grip the ground with your toes, squeeze your buttocks alternately and walk. Now relax your toes, squeeze your buttocks alternately and walk. Are you bathed in bright light yet? Did the penny drop and the light come on? You’ve now covered 4 out of 10 points, it’s probably taken you less than 5 minutes, and already you’ve got more biomechanical awareness than most people I meet. This is a cerebral one; which muscle groups would you like to employ when you run? Toes or buttocks? It’s your choice. And it’s an either/or thing because it’s down to biomechanics. It’s not instinctive to engage your toes and your buttocks together; you really have to think about it, and it’s almost impossible to move smoothly or comfortably with that muscle combination in play. If the toes are busy, your buttocks will be unable to operate to their capacity when you’re in forward motion. The buttocks will have to relax to a degree. If the buttocks are busy whilst moving forward, the toes are relaxed. And didn’t this way round feel so much better? If you’re leaning forward, the toes are busy. If you’re upright, the toes relax and the buttocks engage automatically. Optimising biomechanics is a win-win game of discovery. Whilst relaxed toes and active buttocks feels better when moving in the forward plane, it is also the most powerful muscle-work combination. Even though there are many more muscles in your feet than in your buttocks, the feet muscles are tiny and the buttocks muscles are proportionally huge. Why would you make walking/running/forward propulsion harder than it needs to be, using the smaller muscle groups? You wouldn’t … knowingly. But anyone who runs with a forward lean, gripping and clawing with their toes, does … unwittingly perhaps, but that’s the reality. Happily, they form a strong collaborative team with the hamstrings, so when the buttocks are fully active in forward motion, so are the hamstrings. Happy days. A buttock and hamstring contraction with every step, every day, thousands of times a day. So muscle tone is there, ready and waiting for when you want to move faster … and run. Upright. Now there’s a thought. Next time you’re out and about, people-watch. Spot the upright walker/runner. There aren’t many. The forward lean seems to be a modern-day, hugely prevalent condition. It’s a shame, because the majority are simply unaware of it; unconscious to the fact they’re dragging themselves through life with their hip flexors and toes, instead of pushing themselves forward with their buttocks and hamstrings. Biomechanical oblivion. But when you’re leaning forward, you effectively shorten your torso, squashing your viscera. So how are you breathing correctly? Your lungs can’t expand outwards to any great degree, because your ribs are pretty solid. Enter your diaphragm muscle, stage left. It sits cross-sectionally through the middle of the body, and when there’s room (when you’re upright! ), it domes down to allow the lower lobes of the lungs to expand fully, to draw in breath through the negative pressure of suction, to oxygenate your entire body. When you’re exercising, your oxygen demand increases through the demand of working muscles, and now that you’re upright, with relaxed toes and active buttocks and hamstrings, you’re able to fulfill the oxygen demand. Exercising becomes easier, because not only can you breathe more easily, your muscles are fully oxygenated too. Are we whispering as loudly as we can yet? Not quite. We’re using the biggest, most effective muscles for the job of faster forward propulsion; we’re encouraging ‘best work’ from them by offering them as much oxygen as possible. But what about momentum? We’re generating it, but if we’re not careful, we’ll lose it again. Your running destination is B, wherever that is. To get there as efficiently as possible, ‘Cadence is King’! If you languish for a while on the ground with each step, you’ll lose the forward momentum your buttocks and hamstrings have created through great body alignment. This is a library whisper. Spending as little time as possible on the ground is a great stage whisper. Sometimes, it’s not what you do, it’s what you don’t do that makes more difference. Don’t waste time on the ground – the ground is an energy depleter, a motion sapper. We have to make contact with it, or we’d be flying, but we don’t need to have a cup of tea whilst we’re there. Just a sip will do. Try it – you’ll go faster, for no more effort, just by not wasting effort. And on our ‘starter for 10, Chapter One’ we haven’t even started on free energy from muscle recoil. One muscle contraction, leads to another in a chain of evolutionary movements, and then each is followed by a rest period of relaxation through the muscle fibres, promoting micro-circulation. Some muscles are required to stretch under load (eccentric muscle loading), much like stretching a coiled spring. As the muscle relaxes after its contraction, the recoil effect generates free energy of the forward propulsive nature. It’s Mother Nature’s design at its most obliging. 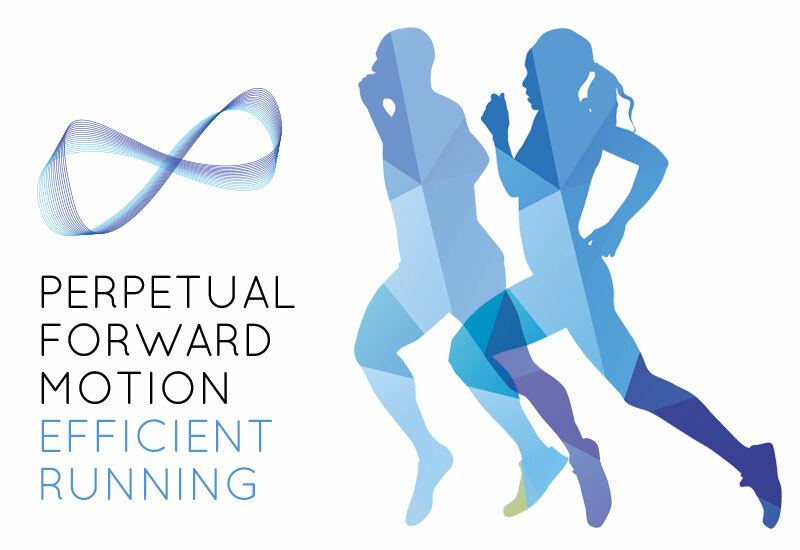 Perpetual Forward Motion is the art of Efficient Running. Efficient Running is having more speed for no more effort, same speed for less effort, and eventually – once your newly discovered muscle groups are more efficient at their biomechanically programmed job, you can have more speed for less effort. Now why haven’t we been discussing this all this time?